Just like each person is unique, each person with autism is also unique. Help your troop to understand that those with autism might communicate in different ways. They have special gifts and talents just like each of the members of their troop. Remind them that kids with autism like birthdays, playing and having friends. Someone with autism might need extra compassion and more people to take the time be their friend. Reach out to your local Autism Society chapter to see if you can arrange for a guest speaker, video or literature to help your troop learn more. 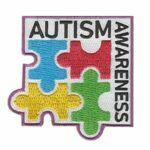 The Autism Awareness patch from MakingFriends®.com makes a great addition to any scout uniform and might even give your scouts an opening to share what they’ve learned with others. Little libraries are showing up all over! Contact your local school, museum, park or other public place to see if they will allow your scouts to add a little library where people can borrow and leave books. It’s a good idea to choose a location the scouts will be able to check from time to time in case your library is needs refilling and the structure remains sturdy. 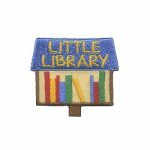 Reward their hard work with this special Little Library patch. 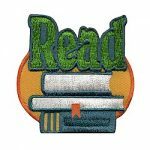 Patch from MakingFriends®.com for troops that do book swaps or other events to promote reading. Makes a great reminder for your community service project if it focuses on literacy. Incorporate this patch while working on your Brownie A World of Girls JOURNEY*. 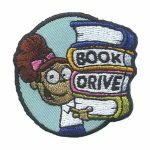 This patch is included in the Story Adventure Badge In A Bag® kit from MakingFriends®.com. Have fun with your girls playing BINGO. 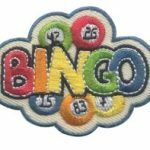 You’ll find fun free bingo themed printable cards on our page Fun and Games. Bingo for Books is another fun event your girls will enjoy. Have girls bring a few gently used books and play until everyone wins. Make it a part of your service project by donating the left over books to a local shelter or little free library. 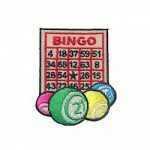 The residents at your local senior center or nursing home would love for your troop to host a BINGO night for them too. 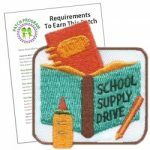 Run a school supply drive or participate in collections and reward your girls with our School Supply Drive patch.